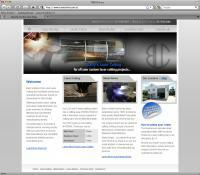 We are extremely happy with the look and function of our new website. Being simple sheetmetal workers we didn't really have any idea of how to put together something like this and are extremely happy with the end result, especially the Content Management System which allows our potential customers to view our Previous Work. The ability to update this in-house is a fabulous innovation and serves to both advertise ourselves and our clients. We would strongly recommend the team at Trent Moffatt Designs to point you in the right direction with your website project.